While in the UK, Kenny will also attend the Champ St Patrick’s Day Reception in Westminster. TAOISEACH ENDA KENNY will travel to Manchester this afternoon to attend a civic reception hosted by Manchester City Council and to officially open phase one of the new Irish World Heritage Centre. The centre is the main venue for the Irish community of Manchester to pursue Irish cultural activities and celebrate Irish heritage. The Taoiseach will then proceed to London for his bilateral meeting with the British Prime Minister in Downing Street on Tuesday. The meeting is said to provide an opportunity for the Taoiseach and the British Prime Minister to review progress across a wide range of areas of collaboration covered in their 2012 Joint Statement. Email “Taoiseach Enda Kenny to meet Prime Minister David Cameron in the UK ”. 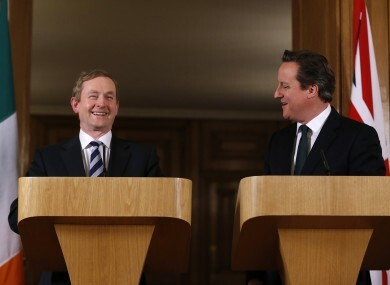 Feedback on “Taoiseach Enda Kenny to meet Prime Minister David Cameron in the UK ”.